Established as an LLC in 2003, Hidden Pearl Farm is a Holsteiner breeding and Hunter/Jumper show barn in southeastern Pennsylvania. It is run by Nick Edmunds and his daughter Sarah Edmunds. We produce a regular supply of Holsteiner hunter and jumper horses from our breeding program, which go into show rings and also other breeding programs around the country. We breed what we like to ride, from pedigrees which have proven successful at the highest levels. Our breeding program is based on a central nucleus of mares of outstanding genetic quality and strong production history. 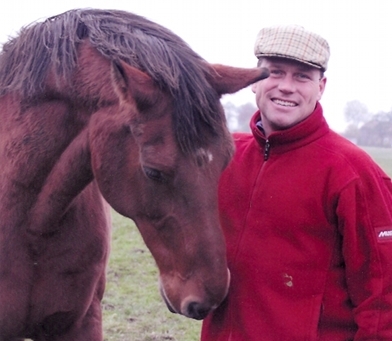 Nick Edmunds' background included an upbringing in the UK, avid Pony Club and regional gymkhana team participation, and success as a young rider in eventing, dressage and jumping, as well as serving as whipper-in for two hunts in the UK. During his time in the British army, he served as a tank commander in the first Gulf War, and completed his commission as the stables officer of the British cavalry regiment, the 16th/5th The Queens Royal Lancers in Cambridgeshire in the UK. His current focus is competing home-bred horses in the Young Jumper leagues, as well as continuing to study breeding data to ensure to maximise the potential of each year's foal crop. We also breed and raise registered Angus cattle at Hidden Pearl Farm. stallion Canterbury HPF taken in Holstein, 2009.